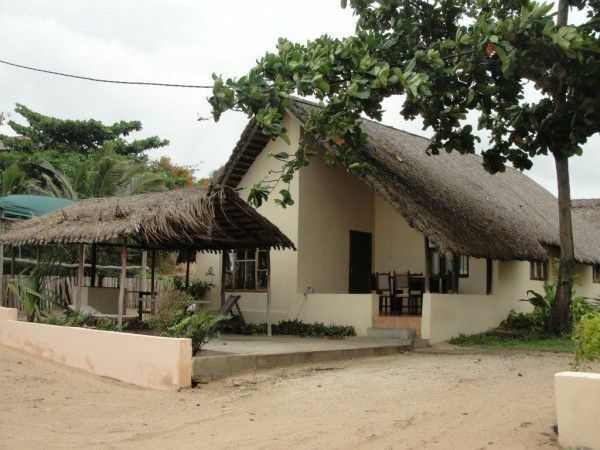 Mozambeat Motel in Tofo, Mozambique has all the facilities to ensure that you enjoy a relaxing stay at our tropical oasis. 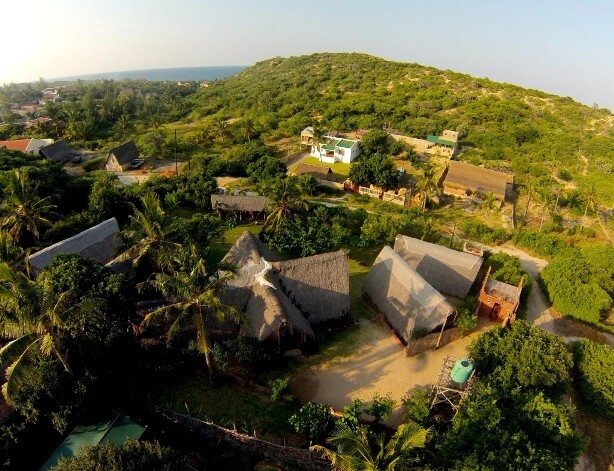 With a range of clean and spacious accommodation, a refreshing pool and a soundtrack to make life feel just that bit sweeter, Mozambeat Motel is the perfect place to relax, meet people and discover the beauty of South Eastern Africa. 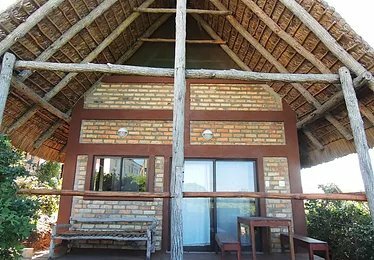 Accommodation at Mozambeat Motel features 7 beautifully appointed cabins. 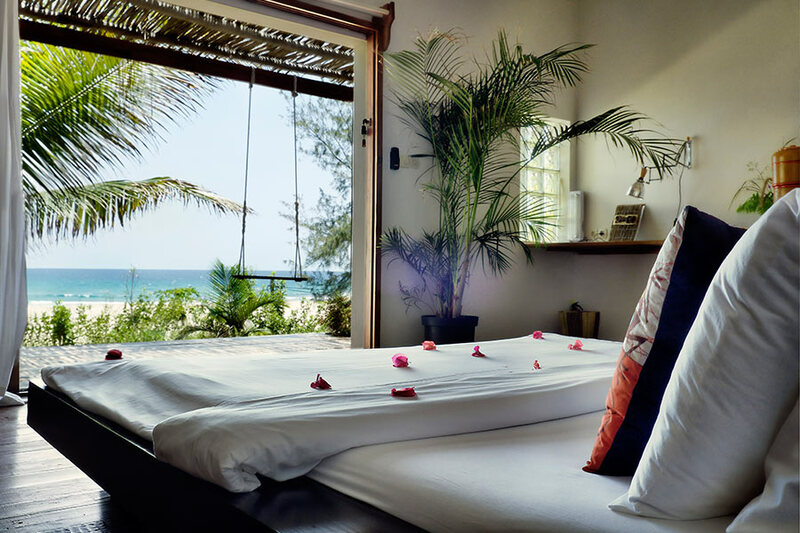 All this goodness is set in a lush tropical environment surrounded by cashew and coconut trees. 6 X Private en-suite cabins feature a beautiful open-air bathroom with rain showerhead. 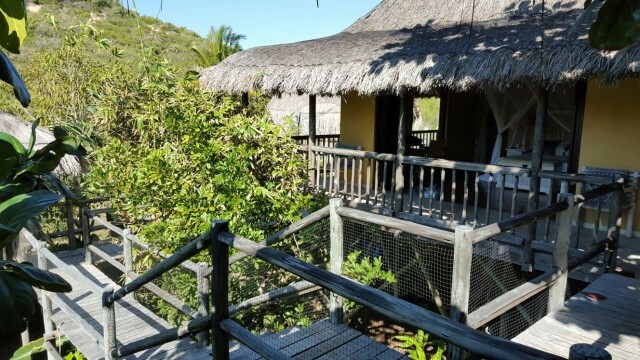 Mosquito netting, towels, toiletries and a private terrace with chairs and an hammock. Private en suite cabin Names and occupancy. Blondie - This room offers 1 double bed and 1 single bed, maximum occupancy is 3 guests. Daft Punk - This room offers 1 double bed, 1 single bed, 1 bunkbed. Ideal for a small group of friends or families. Maximum occupancy is 5 guests. Diana Ross - This room offers 2 double beds, maximum occupancy is 4 guests. James Brown - This room offers 1 double bed, maximum occupancy is 2 guests. Mick Jagger - This room offers 2 double beds, maximum occupancy is 4 guests. Ray Charles - This room offers 1 double bed, maximum occupancy is 2 guests. for those that enjoy the silence. 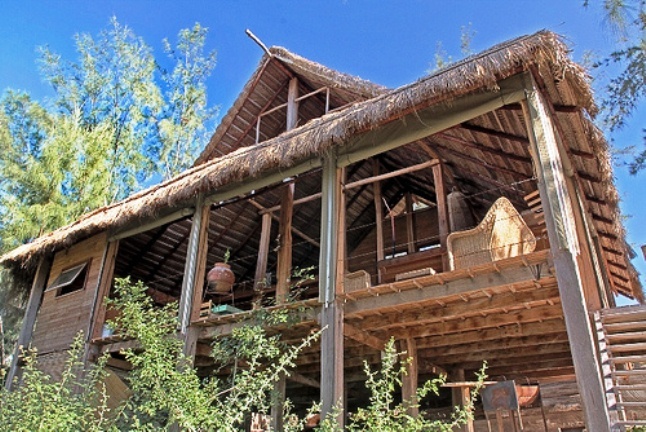 This is a brick and thatched roof house, big sliding door, private en suite (indoor) bathroom with rain shower. All suites are appointed with ceiling fan, extra length double mattress (2mtr), mosquito netting, towels and toiletries. George Clinton - This room offers 2 double beds, maximum occupancy is 4 guests. Prince - This room offers 1 double bed, maximum occupancy is 2 guests. Ziggy Stardust - This room offers 1 double bed and 1 single bed, maximum occupancy is 3 guests. The dorm is where it is at offering you the perfect opportunity to meet that travel companion for a dive or surf together. Our funky dorm cabin "Kool & The Gang" is a shared mixed dorm with 5 bunk beds. It has lockers, ceiling fans, extra length mattresses, mosquito netting and an ensuite bathroom. It's a bit ‘more luxurious’ compared to other backpackers here in town. next to our veggie garden we have 3 pre-pitched tents. The pre-pitched tent is a simple safari tent from 3 x 3 mtrs, with a double bed, mosquito netting, towels, electricity plug and a light in it. This is the perfect type of accommodation for a couple that's travelling low-budget. 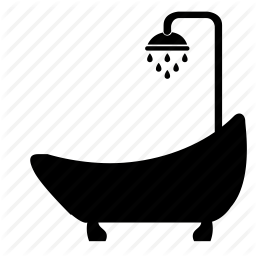 There is an outdoor shower, but you can also decide to shower in one of our ablution blocks. Camping - For those of you who just love the outdoors and carry your home on top of your car, we have a campsite just for you. It's a big piece of land with the shades of palmtrees. It features power plugs, lights, entrance for car (4x4) and an ablution block. 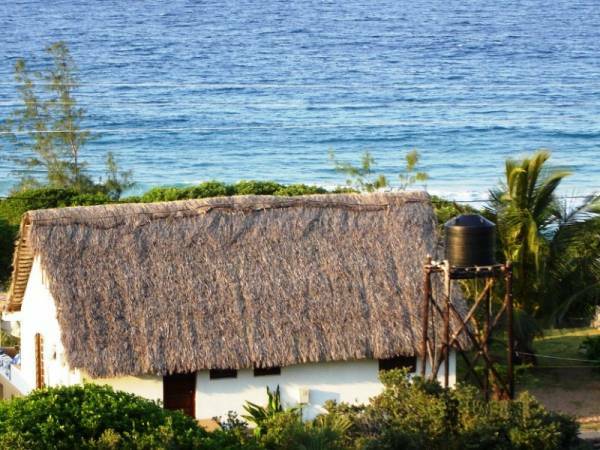 Please note Mozambeat Motel does not offer any more self-catering facilities. Obviously, you can make use of all the lodge facilities. 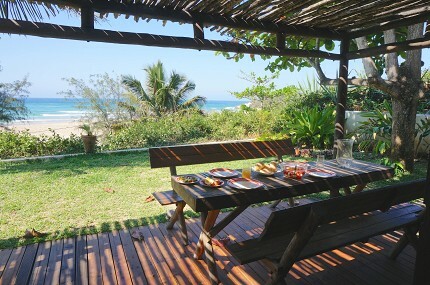 Set about 1.2km back from the Beach and With the enormous 2nd floor deck, guests can enjoy unique views of the incredible Tofo sunset over the beautiful canopy of palm, coconut and cashew trees. And for our more social guests, the stylish deck doubles up as a playful dancefloor in the evening, creating the perfect atmosphere to unwind and meet new people. A well stocked bar hosts a range of fine beers, spirits and cocktails, with hammocks and cushions to smoothe out any stresses. At Mozambeat Motel we serve daily the most tasty food available in town, from local fresh fish to grilled piri-piri chicken. features, a collection of fresh foliage and your daily soundtrack to provide a cool, cosy and funky setting. Mozambeat Motel also hosts weekly movie nights, featuring cult and comedy classics on our state of the art projector screen. 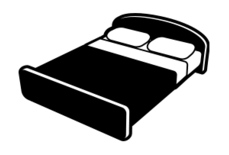 Rates are for 2 people / per unit per night on a bed and breakfast. 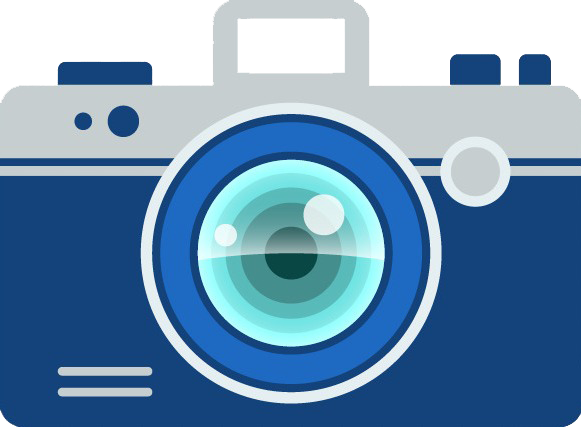 For rates on 3 and up to 5 people sharing, please contact us for a quote.